Perfect for a small space, this chairside end table packs a lot of vintage industrial edge into its small frame. 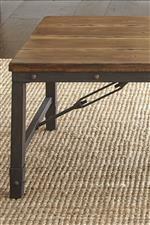 The iron base features details like nailhead trim and cable stretchers for an authentic industrial feel. A planked solid pine table top completes the look, bringing a sense of rustic warmth to the small accent table. The Ashford Industrial Chairside End Table by Steve Silver at Walker's Furniture in the Spokane, Kennewick, Tri-Cities, Wenatchee, Coeur D’Alene, Yakima, Walla Walla, Umatilla, Moses Lake area. Product availability may vary. Contact us for the most current availability on this product.